DBL Kuntze & Burgheim is a laundry located in the north of Germany. Founded in 1928 in Hannover, nowadays the company is still family owned. Mrs. Claudia Kuntze-Raschle, Mr. Jan Kuntze and Mr. Urs Raschle are not just the owners in third generation. They are also deeply involved in the day-to-day business. Their laundries are producing on two sites. The HQ in Hannover and the newer facility in Hermsdorf close by Magdeburg. In total they have 31 Milnor machines in their laundries, including Germany’s oldest Milnor washer-extractor that is still in operation (built in 1969). 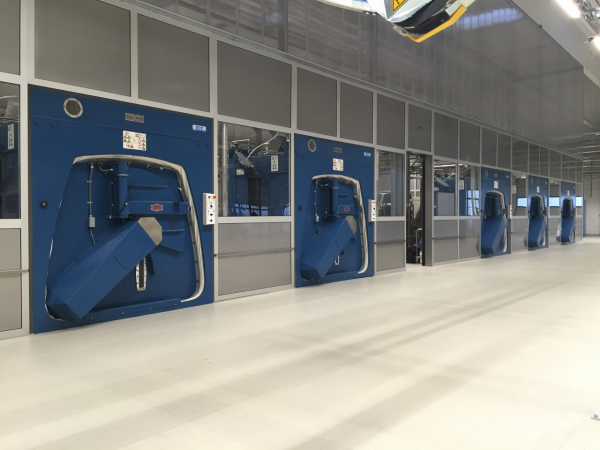 Eleven washer-extractors are installed in Hannover and twenty machines in Hermsdorf. 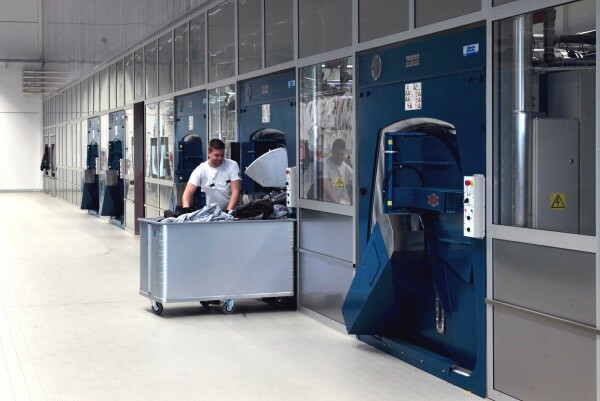 The site in Hermsdorf is processing around 40,000 pieces of workwear per week in one shift. With the new extension, they will double the production. Currently 18 Mercedes Sprinter trucks are covering their customer base in a radius of 180 km. The second extension in Hermsdorf started off last year. The concept is based on barrier washer-extractors to match the highest hygienic requirements. 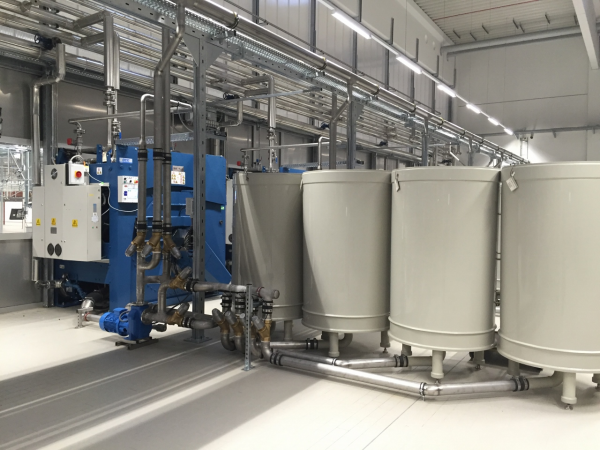 DBL Kuntze & Burgheim uses a complex water recovery system which has been developed in-house. These reuse systems are important to safe fresh water and, even more important, to reduce the cost-intensive waste water to a minimum. Therefore their machines have to have a flexible microprocessor control in order to do the “hand-shake” between systems. In total they bought five new Milnor 60044 SR2 StaphGuard® washers with a loading capacity of 205 kg each. These machines are equipped with the latest Milnor MilTouch-EX™ control which has been implemented into their existing Mildata network. The Milnor Mildata is a machine network which connects all of their 31 Milnor washer-extractors in Hermsdorf and Hannover. Wash formulas are programmed, stored, and managed on a server. In addition, the plant manager has the ability to create production reports and monitor the operation in real-time. At the beginning of the project, all kind of ideas have been taken in consideration. Some of the early ideas included CBW® tunnels and Open Pocket washer-extractors. In the end, the Kuntze & Burgheim chose washer-extractors for flexibility, since the product range of workwear has been increasing incredibly. To be able to process workwear under hygienically perfect conditions that comply with German regulations, they went for the Milnor Staph Guard® barrier washers. In Germany there are a number of strict regulations regarding linen for certain industries. Regulations from the healthcare sector have been extended on to other industries like work-wear processing for the food industry. “These regulations will probably get even tighter in the near future. That's one of the reasons why customers like DBL Kuntze & Burgheim decided to go for barrier washers. They wanted to be prepared for the future.” Florian Ott says. 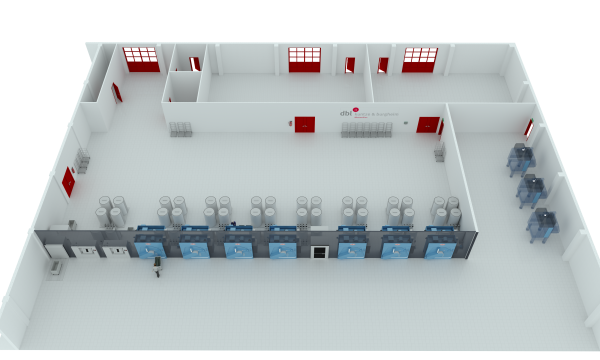 For the past two years Ott Waeschereitechnik GmbH has been using a state-of-the-art 3D simulation software in order to get customers the best view for a layout. The advantages of 3 dimensional drawings are obvious. A photo-realistic 3D presentation (with a flexible all around view) decreases design mistakes during the planning process. Even for people without a technical background, it is very easy to understand the installation details quickly. Furthermore, it gives the installation teams a far better impression of a layout and reduces costly misunderstandings during the installation. During the planning phase Milnor and the German Dealer Ott Waeschereitechnik supported them with their expertise and drafts for their layouts. “Ott provided us with various 3D simulations during throughout the planning process. It was very helpful to see the layout from different angles and perspectives, rather than just having a 2D drawing only.” Mr. Kuntze says. 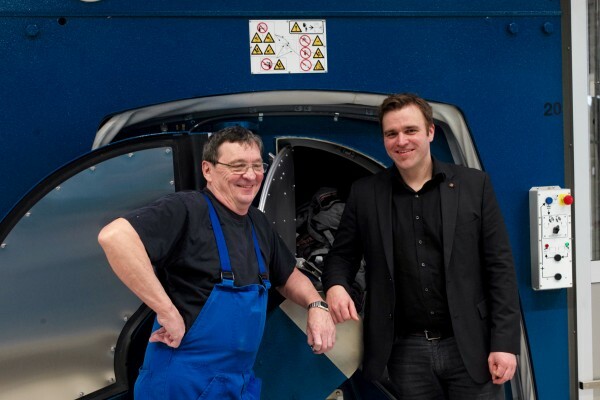 The Milnor Staph Guard® washers are combining a number of advantages which DBL Kuntze & Burgheim have been experiencing in their existing laundries for many years. First of all, these machines are true barrier machines, including the StaphAirtrol which controls the airflow of the machine vent. The StaphAirtrol is a patented device which stops air from the soil side going in to the machine and on the other hand air from the machine going in to the clean side. In effect the machine “inhales” air from the clean side and “exhales” the air into the dirty side. This is an important feature to match the German regulations for hospital and healthcare linen. In addition, the Milnor Staph Guard® washers use a special suspension system to increase the wash action. During extract the inner machine hangs on hydro cushions on the outer frame. During the wash process pneumatic push-downs push the inner machine on to the floor. To sum up, it can be said that these machines are washing like a rigid mount machine with a very effective and verifiable wash-action. During the extract step, it is a fully suspended machine with very little stress to the floor. Especially for the German market, with its strict regulations for laundries that are processing workwear for the healthcare sector and the food industry, the Milnor Staph Guard® washers are a perfect match. One of the things for this customer was the latest Milnor MilTouch-EX™ machine control. “This new control is a tremendous help for the operator and the technicians. We have installed twelve large Milnor washers with the new MilTouch-EX™ controls last year in the DBL group. The feedback from our customers is positive through and through. In our opinion it is currently the best control in the industry,” Florian Ott says. MilTouch-EX™ utilizes resistive touch screen technology and full VGA resolution, the MilTouch control has a clear and informative display which shows current machine status info including total formula time and time elapsed. With complete programming flexibility, formulas can be developed on a PC, saved to USB external memory and uploaded with a screen touch. With intuitive fault diagnosis and relevant troubleshooting suggestions, the MilTouch-EX™ control streamlines employee training and eliminates operator guesswork.